We are a residential architectural firm specializing in new custom homes, renovations, and additions. Our focus is on our individual clients. We pride ourselves in listening to our clients, fulfilling their dreams and desires, and managing the experience for you, from conception to completion. Curtiss W. Byrne Architect, LLC is a an award winning architectural firm in St. Louis, Missouri specializing in quality creative solutions for all types of residential projects. Curtiss W. Byrne Architect has received Best of Houzz for Design and/or Customer Service every year since 2013. Curtiss received his Master of Architecture degree from Washington University in St. Louis and has over 25 years experience. Curtiss is a member of the American Institute of Architects (AIA) and is also certified by the National Council of Architectural Registration Boards (NCARB), “the profession's most objective standards of competence”. JG Design is a full service architectural firm. They specialize in residential renovations, additions, space planning and new construction, but also love working on commercial/ retails spaces. We are a full service, Award Winning, Architectural + Interior Design firm with extensive residential design experiences, focused on customized home projects, with Specialties in Contemporary, Modern residential designs. Specialty in transforming and re-purposing existing homes. Experienced in working with and representing long distant clientele. In addition to our Residential Design services, we have extensive experiences on a broad range of project types, including Commercial, Cultural-Institutional, Educational, Hospitality, Retail, Sports & Recreation and unique Creative Designs. Senior Designer at Mosby Building Arts since 2012, providing collaborative designs with client's needs, desires, and investment levels at the forefront. Works with all styles including traditional, modern, eclectic, transition and contemporary. My architectural design firm focuses primarily on residential projects. I design new houses, additions and renovations to existing homes. My approach is to carefully study my clients' practical needs and aesthetic aspirations and then look at the design challenge from many different angles. The project evolves as the client responds to different design options. What emerges is an innovative, inspiring design uniquely suited for the client. I received my graduate degree from Washington University in 1989. I have been a registered Architect since 1993 and established Christopher D. Marshall Architect, LLC in 2005. I work in collaboration with Dave Connally (Master of Architecture, University of Michigan, 2001) and Sole Van Emden (Master of Architecture, Washington University, 1993). Studio|Durham Architects is dedicated to creating architecture that is sensitive to the project's unique environment and built context. Our approach is to work with each client in a highly interactive process to fulfill the programmatic requirements, while maintaining a commitment to award winning design. The firm's projects have received numerous design awards, and have been featured in national and regional publications. Environmental issues have been one of the central focuses of the firm's practice since being founded in 1992. Sustainable strategies are employed to create architecture that conserves natural resources while creating healthy and inspiring built environments. We are always interested in projects that have good design opportunities, whether large of small. The firm's offices are located in a renovated circa 1880's warehouse in the Soulard neighborhood of St. Louis. Donna Boxx EXCELS in residential architecture. With an eye for architectural finesse and 40 years experience, Donna Boxx can deliver on new construction, an addition and/or a renovation you’ve been dreaming of from the beginning stages to the final product. Her design methodology encourages client participation and collaboration with engineers, consultants and contractors resulting in a finished product that always reflects the individuality of the client. Her goal is to provide the most cost effective solutions by utilizing an optimal design plan that balances ideals, aesthetics and budget. Hiring an architect is a necessity, not a luxury. Proudly offering professional architecture and design services for over 36 years. The Boxx team has a combined 72+ years of architectural experience designing new homes, additions and renovations, working on most any architectural style. Scott Krejci is a graduate of the University of Kansas School of Architecture and provides more than 40 years of experience in architecture design services for new homes, additions and renovations, select commercial, and historic tax credit projects. Since its founding in 2004, Anton Architecture has helped its Clients achieve their dreams. We are a solution-oriented firm that provides advice and guidance throughout the design and construction process. By offering design options, we make it possible to have a great house which you can afford. Whether designing a new home or reorganizing the layout of an existing one, we create value through design. This means designing beautiful, well-organized, cost-effective homes which are greater than the sum of their parts. We emphasize well-crafted solutions which magnify your investment. 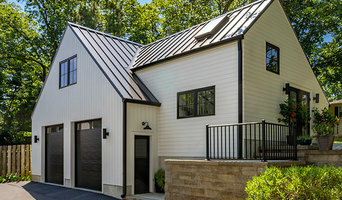 Jim Bulejski Architects is a professional Architectural firm specializing in single family homes, additions, historic renovation, and small office/retail. With over thirty years of quality design and thorough execution, we are experienced in designing quality custom homes and additions for both Owners and Builders. Our projects vary — from innovative luxury solutions to creative modest remodels. Whether you are building new or adding on, we offer services that are attentive, individualized and responsive. Our goal is to bring your ideas to life in a way that exceeds your expectations. Killian Smith Architect + Associates, P.C. is a privately held professional corporation established in 1992 to provide professional architectural services, interior space planning, and consulting. We are committed to delivering the highest level of quality service to our clients without compromising innovative design goals. Our clients have relied on us to meet their sometimes strict budget and time constraints. We take pride in meeting these goals in addition to providing imaginative design, technical competence and accountability to our client's satisfaction. Although we try to design each project with the environment in mind, we can also assist owners with obtaining LEED certification and documenting strategies for: sustainable site development; water savings; energy efficiency; materials selection; indoor environmental quality and design innovation. How do I find the best Ballwin architect for my home design project? It is best to hire a home architect who will be involved in all phases of the design process, from the initial concept to the completed construction. The architect is often the first person you will hire for your project. If necessary, they might also help you select and hire Missouri subcontractors, which can include the builders, engineers and landscaper. Interior architects are also involved in negotiating contracts for all involved participants. It is for these reasons that it is extremely important for you to have a good relationship with the Ballwin residential architect you hire. He or she can be the tie-breaking vote between you and the general contractor and can be your biggest advocate during the construction process. Different architecture firms in Ballwin, MO provide different services, so the scope of the work can span from pre-design environmental impact studies to selecting furniture and finishes, depending on what your specific needs are. It is very important to hire the right professional for the job. Remember that the most well-known or established designer might not provide the best architectural services for your needs. It all comes down to the individual project. Research and ask people whose work you like for recommendations. It's important to have somewhat of an idea of the style of house architecture that you prefer, as well as the amount you would like to spend. Residential architects in Ballwin, MO are natural problem solvers. They will assess the entire situation and help you to solve your problems too. Don't settle for a single company too early. Call and interview a few. Make sure that you feel like your personalities will mesh well and that you like their professional perspective. Find a home architect in Ballwin, MO on Houzz. Narrow your search in the Professionals section of the website to Ballwin architects. You may also look through photos of Missouri projects to find interior architects and building designers who have worked on a project similar to yours.